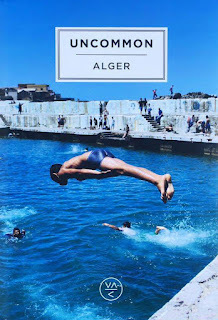 M. Kaci: Connecting with us from Algiers, the American photographer and traveler Andrew Farrand. 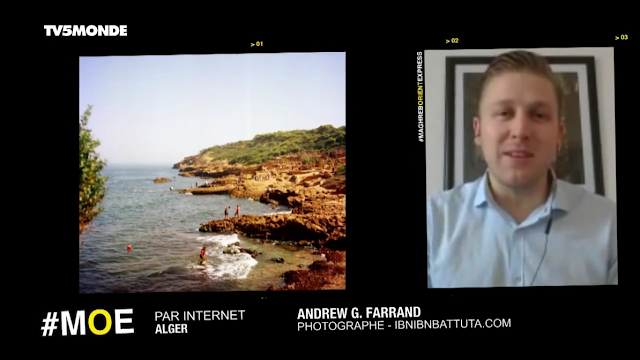 Thank you for being with us, Andrew, live from the Algerian capital. You are very, very well known on social media and the internet under the name Ibn Ibn Battuta, named for the great 14th century explorer. You have lived in Algiers since 2013, for over three years. What led you to care so much for and fall in love with this country, Algeria? Andrew Farrand: First it's the Arabic language and culture that made me interested in this entire part of the world. Then it was work that brought me here for the first time, then to live here in 2013. Since then, in addition to working here, I try to spend as much time as possible exploring the country and discovering the people, the culture, etc. Mohamed Kaci: So we're seeing your photos on the screen, Andrew, we're discovering them now. And speaking of your photographic work, you traverse Algeria so what are your favorite parts of this country? Andrew Farrand: Ah, that's tough to say. In fact, I'm based in Algiers so I know Algiers a bit better than the rest of the country, but I've had the good fortune to visit quite a few regions, from the West to East, to the South and the great desert. It's a very diverse country, so it's difficult to choose one favorite region. But I could say that I like the desert perhaps a bit more than anywhere else; it's really special. But I really enjoy exploring every corner of the country. Mohamed Kaci: So we're going to speak later today about this great explorer Ibn Battuta with Agnès Carayon, who's here in the studio with us. Why did you choose to take as your pseudonym the name Ibn Ibn Battuta, meaning "the son of Ibn Battuta"? Andrew Farrand: Yes, that's right, it's a little play of words in Arabic. In fact he's someone who inspired me a lot when I first learned about his travels in school and then when I read his great work, Ar-Rihla, or The Travels, describing the great voyage he made from Morocco to China. He's someone who was passionate about culture, curious to discover other parts of the world, and so he's someone who's inspired me. I also felt this attraction toward other people, other cultures, and so that's why I picked this name for my blog and my work there. Mohamed Kaci: Andrew, just a few words to finish up. Algeria is very, very far from the United States, across the Atlantic, in Africa. How is Algeria perceived, what do you hear about this country in the US? 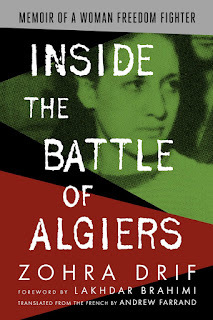 Andrew Farrand: I think in fact that Algeria is fairly unknown in the United States, unfortunately. And that's a gap I'm trying to fill. I try to present Algeria to people who don't know it. That's really one of my objectives for the blog and for the photos that I take—to present a country that's unknown but that should be known, because it's huge, it's important, it's beautiful, and very interesting. And so I try to bring some information and some images of it to people back home. Mohamed Kaci: Thank you so much for being with us, Andrew, here on Maghreb-Orient Express on TV5 Monde. 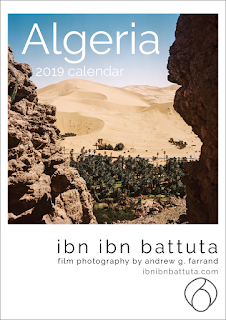 Just to recap, you are a photographer living in Algeria, and also it's possible for those who want to discover your photos to procure a 2017 calendar on your blog. Thank you very much, Andrew, for having been with us. Thank you to the talented French teachers I spent many years learning from, who made it possible for me to speak French on live television without embarrassing myself. And thank you to all the Algerians near and far who have written me such kind messages of gratitude since the video aired. It's a pleasure to share a bit of Algeria with the wider world!